There are many Factors that influence the 'Voice' of a Valve Amplifier but the Dominant Voicing is usually achieved by setting the 'Bias' and 'Gain' on the Preamp Valve. This is preset by the Manufacturer, with No User Access. As the end user, You Can change the Volume and Tone of the Amplifier but can not generally access the Primary 'Voice' Settings. Most RAT Valve Amps have a 3 Position 'Bias' Switch and a 3 Position 'Gain' Switch. This gives you 9 Combinations of 'Voice' settings on the Preamp Valve. From 'Pure Clean' -to- 'Major Crunch' - it makes the Amp a Lot more Versatile with a High Chance that you can find the Sound you want. 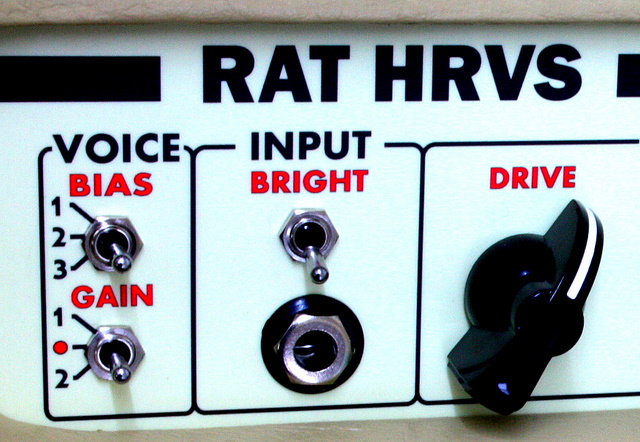 Unless otherwise stated, the RAT 'Bias' and 'Gain' settings do not provide the 'Ultra High Gain' Sound. This Requires a Second or Third Preamp, again, with it's own 'Bias' and 'Gain' settings. However, you can easily attain the High Gain sound by using a 'Boost' -or- 'Overdrive' Pedal. All RAT Amps 'Love' Pedals. Not All Amps are Fitted with 'Both' Switches.